DIE Sabbati, 14 die Junii. Message to them, with the Petition of the Scots Officers. Devereux to be Parson of Gateside. Lindsey, sued by Jackson, for releasing Dunkley. Captain Trelawney's Petition, to be freed from an Arrest. 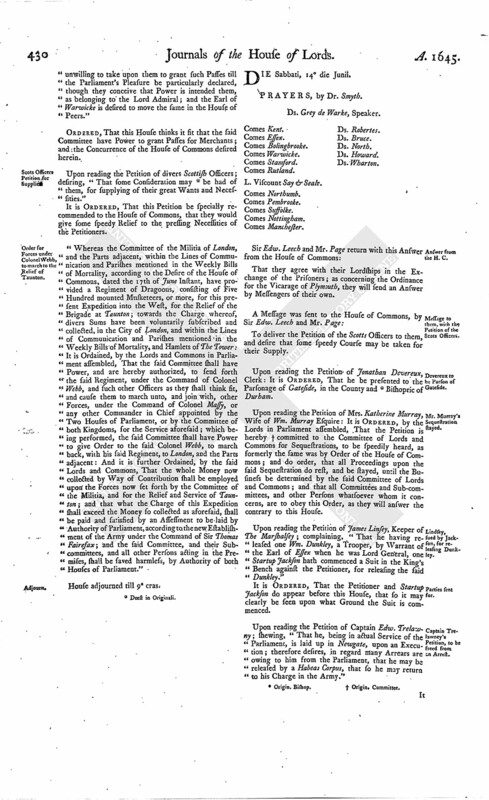 Ordinance for the Northern Association. Lord Say's Relation of the Negotiation of the Sub-committee of both Kingdoms. 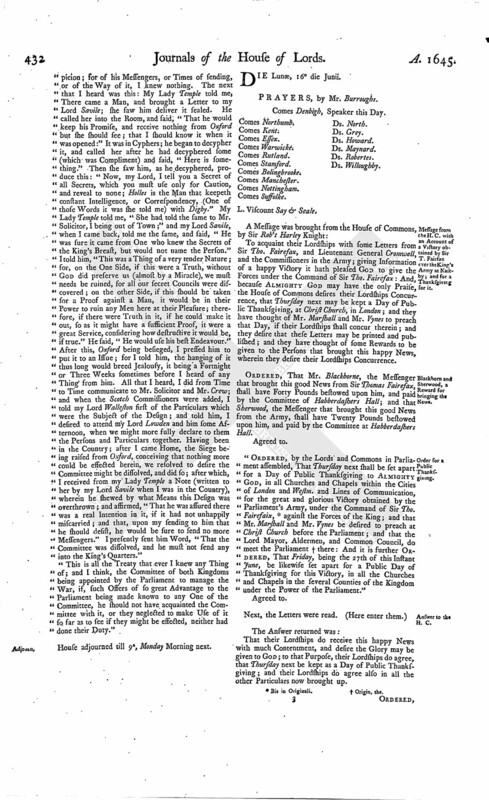 Report concerning Lord Digby's Letter. Scots Commissioners to be acquainted with it. Burning Burleigh House, to be enquired into. Message to the H. C. about acquainting the Scots Commissioners concerning Lord Digby's Letter. Lord Say & Seal's Relation of the Negotiation of the Sub-committee of both Kingdoms, for procuring the Delivery of some of the King's Garrisons, &c. to the Parliament. While this Report was making, the First Order was found. That they agree with their Lordships in the Exchange of the Prisoners; as concerning the Ordinance for the Vicarage of Plymouth, they will send an Answer by Messengers of their own. To deliver the Petition of the Scotts Officers to them, and desire that some speedy Course may be taken for their Supply. Upon reading the Petition of Jonathan Devereux, Clerk: It is Ordered, That he be presented to the Parsonage of Gateside, in the County and (fn. 1) Bishopric of Durham. Upon reading the Petition of Mrs. Katherine Murray, Wife of Wm. Murray Esquire: It is Ordered, by the Lords in Parliament assembled, That the Petition is hereby (fn. 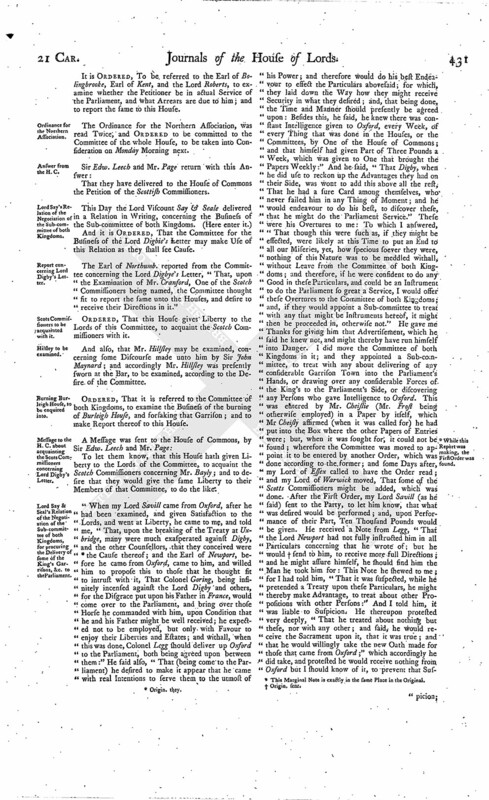 2) committed to the Committee of Lords and Commons for Sequestrations, to be speedily heard, as formerly the same was by Order of the House of Commons; and do order, that all Proceedings upon the said Sequestration do rest, and be stayed, until the Business be determined by the said Committee of Lords and Commons; and that all Committees and Sub-committees, and other Persons whatsoever whom it concerns, are to obey this Order, as they will answer the contrary to this House. Upon reading the Petition of James Linsey, Keeper of The Marshalsey; complaining, "That he having released one Wm. Dunkley, a Trooper, by Warrant of the Earl of Essex when he was Lord General, one Startup Jackson hath commenced a Suit in the King's Bench against the Petitioner, for releasing the said Dunkley." It is Ordered, That the Petitioner and Startup Jackson do appear before this House, that so it may clearly be seen upon what Ground the Suit is commenced. Upon reading the Petition of Captain Edw. Trelawny; shewing, "That he, being in actual Service of the Parliament, is laid up in Newgate, upon an Execution; therefore desires, in regard many Arrears are owing to him from the Parliament, that he may be released by a Habeas Corpus, that so he may return to his Charge in the Army." It is Ordered, To be referred to the Earl of Bolingbrooke, Earl of Kent, and the Lord Roberts, to examine whether the Petitioner be in actual Service of the Parliament, and what Arrears are due to him; and to report the same to this House. The Ordinance for the Northern Association, was read Twice, and Ordered to be committed to the Committee of the whole House, to be taken into Consideration on Monday Morning next. That they have delivered to the House of Commons the Petition of the Scottish Commissioners. And it is Ordered, That the Committee for the Business of the Lord Digbie's better may make Use of this Relation as they shall see Cause. The Earl of Northumb. reported from the Committee concerning the Lord Digbye's Letter, "That, upon the Examination of Mr. Cranford, One of the Scotch Commissioners being named, the Committee thought fit to report the same unto the Houses, and desire to receive their Directions in it." Ordered, That this House gives Liberty to the Lords of this Committee, to acquaint the Scotch Commissioners with it. And also, that Mr. Hillsley may be examined, concerning some Discourse made unto him by Sir John Maynard; and accordingly Mr. Hillsley was presently sworn at the Bar, to be examined, according to the Desire of the Committee. Ordered, That it is referred to the Committee of both Kingdoms, to examine the Business of the burning of Burleigh House, and forsaking that Garrison; and to make Report thereof to this House. To let them know, that this House hath given Liberty to the Lords of the Committee, to acquaint the Scotch Commissioners concerning Mr. Bayly; and to desire that they would give the same Liberty to their Members of that Committee, to do the like. (fn. 4) While this Report was making, the First Order was found. "When my Lord Savill came from Oxford, after he had been examined, and given Satisfaction to the Lords, and went at Liberty, he came to me, and told me, "That, upon the breaking of the Treaty at Uxbridge, many were much exasperated against Digby, and the other Counsellors, that they conceived were (fn. 3) the Cause thereof; and the Earl of Newport, before he came from Oxford, came to him, and willed him to propose this to those that he thought fit to intrust with it, That Colonel Goring, being infinitely incensed against the Lord Digby and others, for the Disgrace put upon his Father in France, would come over to the Parliament, and bring over those Horse he commanded with him, upon Condition that he and his Father might be well received; he expected not to be employed, but only with Favour to enjoy their Liberties and Estates; and withall, when this was done, Colonel Legg should deliver up Oxford to the Parliament, both being agreed upon between them:" He said also, "That (being come to the Parliament) he desired to make it appear that he came with real Intentions to serve them to the utmost of his Power; and therefore would do his best Endeavour to effect the Particulars abovesaid; for which, they laid down the Way how they might receive Security in what they desired; and, that being done, the Time and Manner should presently be agreed upon: Besides this, he said, he knew there was constant Intelligence given to Oxford, every Week, of every Thing that was done in the Houses, or the Committees, by One of the House of Commons; and that himself had given Part of Three Pounds a Week, which was given to One that brought the Papers Weekly:" And he said, "That Digby, when he did use to reckon up the Advantages they had on their Side, was wont to add this above all the rest, That he had a sure Card among themselves, who never failed him in any Thing of Moment; and he would endeavour to do his best, to discover these, that he might do the Parliament Service." These were his Overtures to me: To which I answered, "That though this were such as, if they might be effected, were likely at this Time to put an End to all our Miseries, yet, how specious soever they were, nothing of this Nature was to be meddled withall, without Leave from the Committee of both Kingdoms; and therefore, if he were confident to do any Good in these Particulars, and could be an Instrument to do the Parliament so great a Service, I would offer these Overtures to the Committee of both Kingdoms; and, if they would appoint a Sub-committee to treat with any that might be Instruments hereof, it might then be proceeded in, otherwise not." He gave me Thanks for giving him that Advertisement, which he said he knew not, and might thereby have run himself into Danger. I did move the Committee of both Kingdoms in it; and they appointed a Sub-committee, to treat with any about delivering of any considerable Garrison Town into the Parliament's Hands, or drawing over any considerable Forces of the King's to the Parliament's Side, or discovering any Persons who gave Intelligence to Oxford. This was entered by Mr. Cheislie (Mr. Frost being otherwise employed) in a Paper by itself, which Mr Cheisly affirmed (when it was called for) he had put into the Box where the other Papers of Entries were; but, when it was sought for, it could not be found; wherefore the Committee was moved to appoint it to be entered by another Order, which was done according to the former; and some Days after, my Lord of Essex called to have the Order read; and my Lord of Warwick moved, That some of the Scotts Commissioners might be added, which was done. After the First Order, my Lord Savill (as he said) sent to the Party, to let him know, that what was desired would be performed; and, upon Performance of their Part, Ten Thousand Pounds would be given. He received a Note from Legg, "That the Lord Newport had not fully instructed him in all Particulars concerning that he wrote of; but he would (fn. 5) send to him, to receive more full Directions; and he might assure himself, he should find him the Man he took him for: This Note he shewed to me; for I had told him, "That it was suspected, while he pretended a Treaty upon these Particulars, he might thereby make Advantage, to treat about other Propositions with other Persons:" And I told him, it was liable to Suspicion. He thereupon protested very deeply, "That he treated about nothing but these, nor with any other; and said, he would receive the Sacrament upon it, that it was true; and that he would willingly take the new Oath made for those that came from Oxford;" which accordingly he did take, and protested he would receive nothing from Oxford but I should know of it, to prevent that Sus picion; for of his Messengers, or Times of sending, or of the Way of it, I knew nothing. The next that I heard was this: My Lady Temple told me, There came a Man, and brought a Letter to my Lord Savile; she saw him deliver it sealed. He called her into the Room, and said, "That he would keep his Promise, and receive nothing from Oxford but she should see; that I should know it when it was opened:" It was in Cyphers; he began to decypher it, and called her after he had decyphered some (which was Compliment) and said, "Here is something." Then she saw him, as he decyphered, produce this: "Now, my Lord, I tell you a Secret of all Secrets, which you must use only for Caution, and reveal to none; Holles is the Man that keepeth constant Intelligence, or Correspondency, (One of those Words it was she told me) with Digby." My Lady Temple told me, "She had told the same to Mr. Solicitor, I being out of Town;" and my Lord Savile, when I came back, told me the same, and said, "He was sure it came from One who knew the Secrets of the King's Breast, but would not name the Person." I told him, "This was a Thing of a very tender Nature; for, on the One Side, if this were a Truth, without God did preserve us (almost by a Miracle), we must needs be ruined, for all our secret Councils were discovered; on the other Side, if this should be taken for a Proof against a Man, it would be in their Power to ruin any Men here at their Pleasure; therefore, if there were Truth in it, if he could make it out, so as it might have a sufficient Proof, it were a great Service, considering how destructive it would be, if true." He said, "He would use his best Endeavour." After this, Oxford being besieged, I pressed him to put it to an Issue; for I told him, the hanging of it thus long would breed Jealousy, it being a Fortnight or Three Weeks sometimes before I heard of any Thing from him. All that I heard, I did from Time to Time communicate to Mr. Solicitor and Mr. Crew; and when the Scotch Commissioners were added, I told my Lord Walleston first of the Particulars which were the Subject of the Design; and told him, I desired to attend my Lord Lowden and him some Afternoon, when we might more fully declare to them the Persons and Particulars together. Having been in the Country; after I came Home, the Siege being raised from Oxford, conceiving that nothing more could be effected herein, we resolved to desire the Committee might be dissolved, and did so; after which, I received from my Lady Temple a Note (written to her by my Lord Savile when I was in the Country), wherein he shewed by what Means this Design was overthrown; and affirmed, "That he was assured there was a real Intention in it, if it had not unhappily miscarried; and that, upon my sending to him that he should desist, he would be sure to send no more Messengers." I presently sent him Word, "That the Committee was dissolved, and he must not send any into the King's Quarters." "This is all the Treaty that ever I knew any Thing of; and I think, the Committee of both Kingdoms being appointed by the Parliament to manage the War, if, such Offers of so great Advantage to the Parliament being made known to any One of the Committee, he should not have acquainted the Committee with it, or they neglected to make Use of it so far as to see if they might be effected, neither had done their Duty." House adjourned till 9a, Monday Morning next. 4. This Marginal Note is exactly in the same Place in the Original.